A book is a different thing for every reader. Really, it is. I don't just mean that readers have different opinions on books. I mean that the book itself will tell a different story to each person on the basis of their life experience, culture, and even age. It'll even tell the same person different stories depending on when they read it. You might recall my blog about a reader who contacted me to say how he'd read a book of mine at two points in his life – the first while he was a young, single soldier, the second time when he'd become the father of a little boy. It was, he said, like reading the book for the first time again and finding it was completely different. He saw a different story because the "extra material" in his head, the experiences that were triggered when he read certain lines, were those of a man whose life had changed. A book or any other work of fiction exists only at the point where it creates an effect in someone's brain. So readers write the part of the book the writer never gets to see. There's no point in telling readers what they ought to see in your book: they see what they see, and that's that, because it's the end of a complex perception process. If they tell you they know what you meant and what message you were sending, it's okay to argue with that, because just as you can't tell them what they think, they can't possibly know what was in your mind when you wrote the story. It requires an understanding on both sides that however non-linear a story a book might appear to tell compared to something interactive like a game, it's still a malleable thing subject to many filters, both in the writer and the reader. I understand that when I write, the most I can do is tell the story and then let go of it. Some readers know that they're seeing a blend of writer and reader that turns into something unique for everyone, almost like two genomes combining and then being further complicated by the expression of genes. Others are convinced that there's a single meaning and that the writer is sending a message. The fact that the message swings wildly between readers – this one thinks you're a communist, the next thinks you're a paid-up Nazi – tends to confirm the theory that everyone reads a different book, and it's not my view of the world they see but their own. 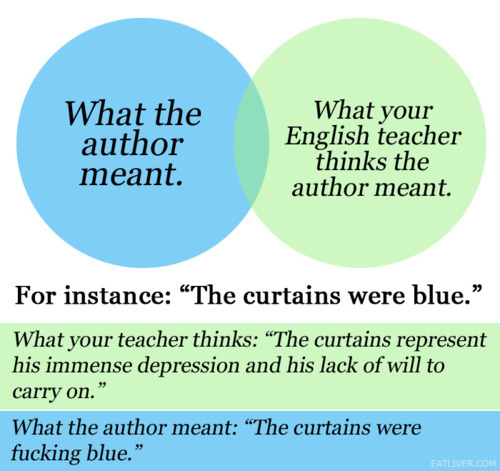 Whatever English lit teachers tell you, there's no definitive meaning, and unless the writer has explained why they wrote it and what they intended, then teachers don't know the writer's motivation and subtext either. With dead writers, they can get away with that. But a college lecturer once contacted me to announce that he'd written a feature referencing me and asked if I'd like to see it. It wasn't the analysis of the books that bothered me: everyone sees a book through their own filters, as I've said, and he seemed to like the novels. But he presumed to also write about my personal politics, which he didn't know anything about because they stay well out of my books, and he got them badly wrong. When he asked my opinion, I pointed out that he could have asked me easily and not attributed views to me that I actually didn't hold. He wasn't terribly gracious about it. In fact, he was pretty rude, and made it clear that he believed writers had no idea what they thought. He seemed to have no grasp of the fact that many writers don't trot out their own politics in every book but actually create diverse characters with varied opinions to entertain others. It's just a story. It's not advocating a lifestyle. A friend who's an academic from a different background said that attitude was fairly common with literature profs, and that they operated from the basis of having an opinion and then trying to prove it was fact, ignoring everything that didn't fit. I'm not entirely sure that's unique to literature, but I was at least glad that the guy didn't do a real job requiring hard data, like running a nuclear power station. Anyway, I finally found a really good example of the malleable nature of even the simplest stories. Years ago, I came across an Indian folk tale about a stone curry. It's a common folk story around the world, sometimes known as stone soup or nail soup: a couple of guys arrive in a village asking for food and shelter, and then take out a bag full of stones (or nails, or other inedible objects.) They ask if someone can give them some onions to make a stone curry, because they have these amazing stones that have a unique flavour. While they're chopping the onions, they ask other villagers if they can just provide a few potatoes so they can bring out the flavour of the stones. Eventually, they have a huge pot of curry bubbling away, another villager provides rice, and the villagers sit down to eat. The two guys are feted as wonderfully generous. Then they finish the meal, fish out the stones, and go on their way to do the same thing elsewhere the next day. Now, when I read that story, it was told as a tale of two con men putting in nothing of value but leeching off the gullibility and generosity of the villagers. Recently, though, I've seen it interpreted as a parable about the value of cooperation and sharing. I still struggle to see the story that way. The facts are the same: the characters do the same thing. There are clearly at least two stories here, probably more, but I can only see one, informed by my own life experiences and cultural filters. And, for the record, the curtains were ******* blue.